Check out the potential for this semi-autonomous, largely automated quadracopter. 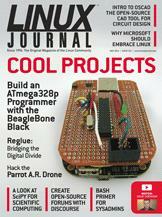 How to build up the hardware from basic components and configure the software to transform the BeagleBone into an ATmega328p programmer. Reglue gives free Linux computers to under-privileged children and their families. Introducing Oscad, an open-source CAD tool for circuit design, simulation, analysis and PCB design. Shawn Powers' The Open-Source Classroom Hulk Bash!